Star rubies are a rare variant of ruby gemstone. The piece of stone is called star due to its efficiency to form a six ray star when the stone is moved around its surface in the presence of the sun or any artificial light. The ability of the stone to form brilliant six ray formation is due to the presence of optical phenomenon called as “Asterism”. The star formation of stone can be best visible when it is viewed under the single source of light such as “sunlight”. 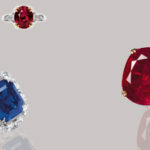 Star rubies are a valuable and rare gemstone. They are principally mined from Sri Lanka, Burma, India, and Africa. Afghanistan, Cambodia and the United States. From all of the above-mentioned sources, India and Africa are referred to as being the most important regions which produce better quality star rubies. What makes a star ruby different from a normal ruby gemstone is the presence of a number of inclusions inside the stone. A ruby demonstrates a star effect due to the existence of heavy inclusions of a small fiber of rutile or silk. The stars are caused by the light reflecting from needle-like inclusions of rutile aligned perpendicular to the rays of the star. Hence a star ruby reflects the star effect due to the presence of inclusion rutile. 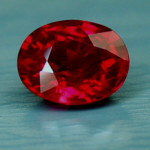 Star ruby is one of the gemstones for which inclusion is mandatory. The star ruby gemstone is called rare because it is extensively difficult to find a high-quality star ruby gemstone which reflects the star effect and good color simultaneously. The worth and rareness of this stone can be understood from the fact that even after mining 1000 pieces of corundum only a few numbers of star rubies are discovered. 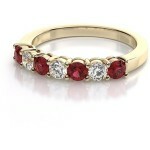 Generally, the star rubies which are found either does not attain good color quality or star effect together. Hence, the above explanation throws light on the scarcity of availability of this stone. 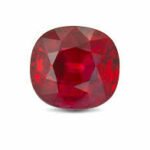 A star ruby stone will attain excellent sharpness and color brilliance. Besides this, the color of star ruby is excellent and possesses high intensity. A star ruby is not totally in red color like a normal ruby stone. Although, the color of star ruby is purplish red, brownish red or pinkish red in color. It is severe to find a perfect colored star ruby. Mostly it is found with some stripes and spots. 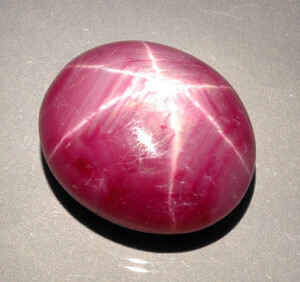 Pink color star ruby stone is described as being the best ruby stone, which displays a perfect star. 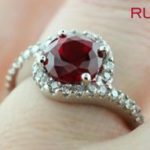 How To Distinguish Between Real & Fake Ruby Gemstone?